I know I’ve mentioned this before but I love staying in on Friday nights and cooking something a little more special than our average weeknight meal. 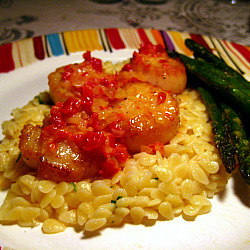 This week sea scallops were on sale at the grocery. Since they are one of my favorites, I decided to base our Friday night meal off of them. I browsed through the highly rated scallop recipes from Gourmet online and thought that this recipe for Seared Scallops with Tomato Beurre Blanc sounded perfect. I love sundried tomatoes so I knew I would enjoy this beurre blanc. I went to a hot vinyasa class at Y2 yoga after work yesterday. The founder of the studio, Tanner, was teaching so I was very excited to check it out. It was an awesome class and I couldn’t believe the amount of work he packed in to 60 minutes. Usually, I prefer 90 minute yoga classes but I don’t think I could have made it through 30 more minutes of this class! I definitely think there was 90 minutes of work packed into the 60 minute class! I left exhausted but with a smile on my face – ready for the weekend and ready for these scallops! I loved this recipe. Simple but delicious preparation. I served it with Orzo “Risotto” (I was going to make real risotto but ran out of time and energy for it!) and roasted asparagus. Perfect Friday night feast! Soak tomatoes in warm water until softened, 20 to 25 minutes (I skipped this step because I used ready to eat softened sundried tomatoes). Drain and pat dry, then mince. Mix together tomatoes, softened butter and salt. Form butter into a log on a sheet of plastic wrap, roll up and chill until firm. About 1 hour in fridge or you can cheat and put the butter in the freezer for about 20 minutes. Cut tomato butter into 12 equal pieces. Heat a small heavy sauce pan over low heat. Cook shallot in 1 piece of tomato butter for about 3 minutes, until softened. Add wine and boil over medium heat until liquid is reduced by half, to about 1/3 cup. This should take anywhere from 5-10 minutes. Reduce heat to low and whisk in remaining cold tomato butter 1 piece at a time, adding each piece before previous one has completely melted and lifting pan from heat occasionally to cool mixture (sauce should not get hot enough to separate). Whisk in water and lemon juice and season with salt and pepper. Transfer beurre blanc to a bowl and keep warm, covered, in a larger bowl of warm water. Rinse and pat scallops dry. Season with salt and pepper. Heat 1 teaspoon of oil in a heavy skillet over medium-high heat. Sear scallops, turning once, until golden on each side and cooked through. About 2-4 minutes total. Work in batches if you need, keeping previously cooked scallops warm on a platter covered with foil. Wipe out skillet and add more oil in between batches. Serve scallops with 3 tablespoons of beurre blanc – either spooned onto the bottom of the dish or spooned over the scallops. I served my beurre blanc over the scallops and the orzo. I love to have different dinners too different from the ones I have on weekdays. Your recipe sounds delicious. Thanks for sharing!